GOOD NEWS KANSAS CITY! We will be adding many new bounce house & Inflatable rental options for Kansas City in 2019. We have selected the majority of the units we are anticipating will become available this summer, and I must say they are quite impressive. You will just have to wait and see. Many new themed bounce houses, combos, obstacles and some interactive inflatable party rentals are expected to be in the order. The season is just around the corner, we have been receiving orders already for spring and summer parties. Make sure you get your party rental reserved in advance to have the most choices for your party rental experience. Many customers have told me "No Child should miss out on an inflatable bounce house birthday party". Kids in Kansas City have proven this to be true. Kansas City has such a diverse population we have yet to meet a child that didn't have fun at a bounce house birthday. Whether they are playing on a Moonwalk, Bounce House, WaterSlide, Inflatable Obstacle Course, or one of our super fun interactive inflatables, the children are always super happy. Don't be "that parent", make sure your kids get the opportunity to have a bounce house party this year. Inflatable Rentals are a great way for your kids to get some excercise and tire them out for the evening. Having a party and want to keep the kids busy while the adults engage? A Bounce House is perfect for keeping the kids entertained and out of your hair. Great for Poker Night, watching a sporting event, or a holiday family get together, you cant go wrong with a bounce house rental in kansas city. Your community event is important to you and requires a tremendous amount of effort to organize. Let us help by bringing out some entertainment for the kids. Making a reservation for our inflatable party rentals is super easy. You can do it entirely online. Pictures and pricing are all listed, just add to cart, enter your details and party info, make a payment to lock it in. Then relax, you will receive a confirmation email immediately, and a reminder email a few days before your event. We will be there. Typically we arrive 15-30 minutes before your reservation start time. Sometimes when we are very busy we have to deliver much earlier, sometimes we are there an hour or 2 hours before just to make sure we can get to everyone without being late. If we are going to be early you can expect a call from our driver confirming that this works out for you. Fear not, your party starting on time is extremely important to us as well and we make every effort to meet that goal. Book your party rental in Kansas City, Overland Park, Olathe, Leawood, Gladstone, Smithville, Blue Springs, Lees Summit, Raytown, Liberty today. 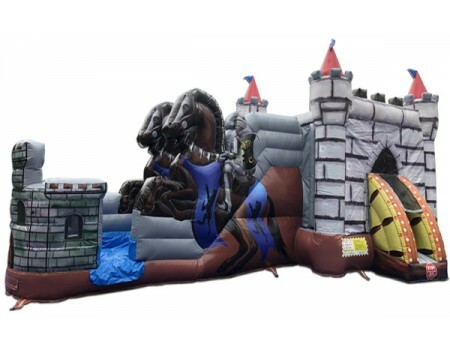 We are your one stop shop for Bounce House inflatable moonwalk obstacle rentals in the KCMO area. Servicing the metro. Bounce House Delivery Setup Take Down And Customer pickup available options. Bounce Rental Parties in Kansas City make a party right. Party Rentals include inflatable bounce house moonwalks and inflatable interactives. Water slide inflatable party rentals are awesome in summer. Kansas City has the best people and the biggest parties. Make your party awesome with bounce houses jumpers, combos, obstacle, and water slides. Party rentals are great entertainment and fundraising devices. Your kid sport team can use bounce house inflatable rentals to help with their booster account fundraisers.